Within the thread in my article “Teaching Kids about Money“, a representative from Moonjar left a comment regarding their Moonjar product for children. As I have a little bambino crawling around the house, I emailed the rep with a few questions and they offered to send me a sample product for me (and the little one) to try. It’s a new-age piggy bank that allows children to separate and store their money into 3 categories; spending, savings, and sharing. They offer two different Moonjar products, the classic and the standard moneybox. The classic moneybox is the stronger version as it is made from hard plastic and tin. The standard version is made completely of paper. What Samples Did We Get? I think that the concept is a great idea that can help teach kids about money. It helps reinforce that money is not only for spending, but should also be used for saving and sharing. 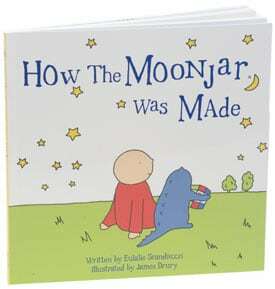 I’m looking forward to using my Moonjar to help teach my little one about saving, spending and sharing. Although the price of the Moonjars are a bit on the high side (IMO), I personally prefer the Classic Moonjar as it’s made of tin thus more resilient than the paper version. If you’re interested in doing more research, check out their site along with their testimonials. What do you think about children products like this? That’s very intriguing. Do you plan on requiring a certain percentage allocation for each category, or let the kiddo decide how much goes into each compartment? Looks interesting. Anything that encourages kids to learn about good financial practices at an early age sounds good to me. A lot of parents could probably learn a thing or two as well! Looks interesting. I want to ask if MDJ and Canadian Capitalist are written by two different people or the same person? The topics today are pretty similar between the two. I am not affiliated with this organization. Forget the kids, I should get ME a Moonjar! I prefer the paper model, that way I can cut a bigger hole in the ‘save’ slot. Not a bad way to start teaching. Anything is better than nothing! Is the sharing component for charitable contributions only? I think it’s a great idea, however I’ll probably use 3 empty glass jars to simulate it. Might as well throw in lessons about reusing, frugality and creativity at the same time. Brad – I think the family should decide how much to put in each compartment. 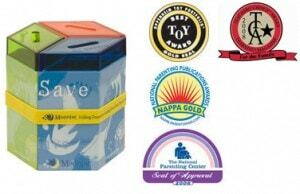 The kit also comes with a notepad that can help track the savings/charity/spending. Cannon – That’s some dry humor brother… but I admit, I did laugh out loud. I think the sharing portion can be used for charity, or simply giving for the greater good. I think that looks like a great little device for both education and for helping the littl’uns save some money. I love the fact that there is a sharing compartment too. I’m with Al on this one. It’s the kind of product that makes me immediately think of copying the idea at home. Simple to do, saves money (i.e., the whole point), and the kids can decorate their own divided piggy banks themselves. The book is necessary to make the divided piggy bank seem special enough that people wouldn’t just make their own. Except that making one’s own is special. Its nice to teach kids to save while they are still young. These kinds of products seem like the fruit of good thinking about how to engage kids about money. I just hope no one thinks they’re a substitute for including kids in the real family conversation about money–where it comes from and where it goes. Like many others, I imagine, I grew up in a household where money was never discussed. I had an allowance and was responsible for managing it, but I had precious little guidance in doing so. I never did–and still don’t–understand why the subject was so hush-hush. Kids learn through imitation and (limited, guided) participation. I’ve often wondered why banks don’t offer a similar product. That is, why not allow the consumer to set some percentage values and then for every deposit the money is allocated to the main account and the attached savings account. Everyone talks about how good a strategy is, why don’t the banks support it? Or do they? Banks do. It’s called a ‘savings account’, and the other side of the equation, which you maintain is called a ‘ledger’. This is where you truly have the opportunity to teach your children about budgeting. The Moonjar allows them to understand different segments in one bank, and you the parent, get to explore the idea of budgeting a large amount into smaller expenditures with your children. Credit Unions often have programs directed towards children that are more sophisticated than bank programs. You might want to have a look. We all should learn this financial exercise, so we can appropriately apply it. However, many don’t, and the success of Mvelopes the envelope method of budgeting, would seem to indicate that many are still focused on little pots of money, rather than a stream with many tributaries. Previous post: Ask the Readers: Advice during a Bear Market?